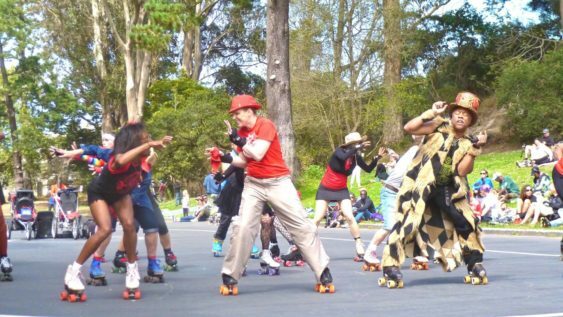 There is a place in San Francisco’s Golden Gate Park that is heaven for Bay Area inline skaters and roller skaters who like to boogie to the funky beat on wheels. The Godfather of Skate brings his mobile DJ unit and plays groovy tunes for you to skate to. On most Sundays, there’s usually someone willing to teach you a few choreographed roller disco dance moves. The area is is called, “Skatin’ Place.” It is located at 6th Avenue and Kennedy Drive in the park. It has been officially dedicated and recognized as the home for outdoor roller skating in the San Francisco. Skatin’ Place is available for skating every day. The group skates there every Sunday from noon to 5 pm. Skaters gather on Wednesdays from about 3 to 5 pm and on Saturdays from 1 to 5 pm. During Daylight Saving Time, they extend the time to 6 pm.